purchaseyoutubelikes.com's web design is very lackluster, using very light colors and an old font. It reminded us of an old newspaper. It's very basic and plain. However, despite the boring design of the site, it is quite understandable. The site is organized conveniently (fortunately, we all know how to read a newspaper), it is easy to understand what the purchasing process instructions for their services are very clear and easily understandable. The content of the page itself compensates for the lack of design. This vendor's prices are quite low, especially when compared to competing sites. The prices for their packages are also reasonable compared to competitors, and they offer several options to choose from - "Economy," "Silver," and "Golden" packages, and the services included in each package are the prices are written very clearly. Payment options are quite limited using PayPal, Payza, Skrill, Liberty, STP, Webmoney and Bitcoin. Apart from these payment methods, this supplier offers the opportunity to pay by other means by writing directly to their support, which we find is a bit of a hassle. Other than that, they have a "guaranteed refund" policy, which clearly states they are committed to refunding customers in cases of failed deliveries or an inability to provide the service. 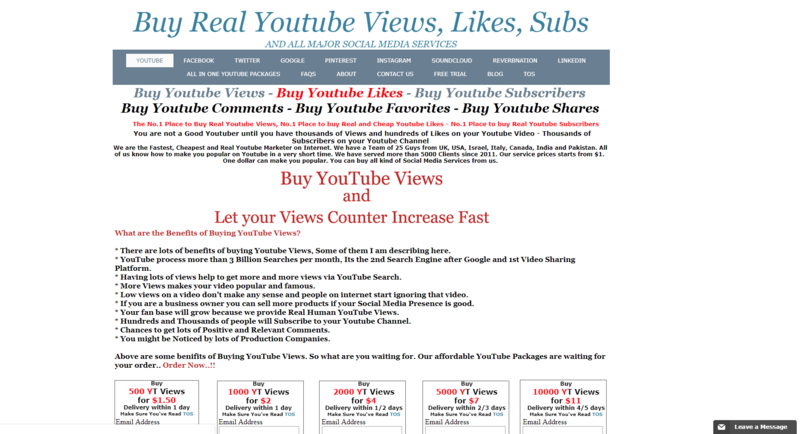 We've made several orders of their YouTube services, and overall we were satisfied. The subscribers delivery time was too fast in our opinion. If they could send the subs even more gradually and even slower, it would be perfect. The views service was provided in the exact time as they promised. That was the disappointing part of purchaseyoutubelikes.com's service. After two days we noticed a severe drop in the number of subscribers (about 320 subs dropped from 500). We also had a drop in the views we have ordered, although not a severe drop, only a few. We have to say that we assumed there would be drops, to begin with, because the low prices seemed to reflect on our expectations from the service quality. purchaseyoutubelikes.com has an online chat in which you can leave a message with your email, and you can also do that on their contact page. So, we don't think there is an advantage to the online chat they have on the site. We contacted their support team, and we found they were unprofessional: it took them much time to answer our request to refill our subscribers order. Even though they refilled our order eventually, we still weren't pleased with the service we had received. The services description is concise. The questions and answers page is also brief and contains almost no information. To know more, you need to contact the team through the "contact" page and wait for an answer that, as we have previously mentioned, takes time to arrive. We highly recommend them to elaborate and give more information about their services. Our final score for this seller is 75/100. The site design is inferior, yet the prices are, and their services perform accordingly, both good and bad - for a low price you receive drops and delayed responses from the support team. All in all, purchaseyoutubelikes.com needs some improvement, but it's not a horrible service, considered you get what you paid for.